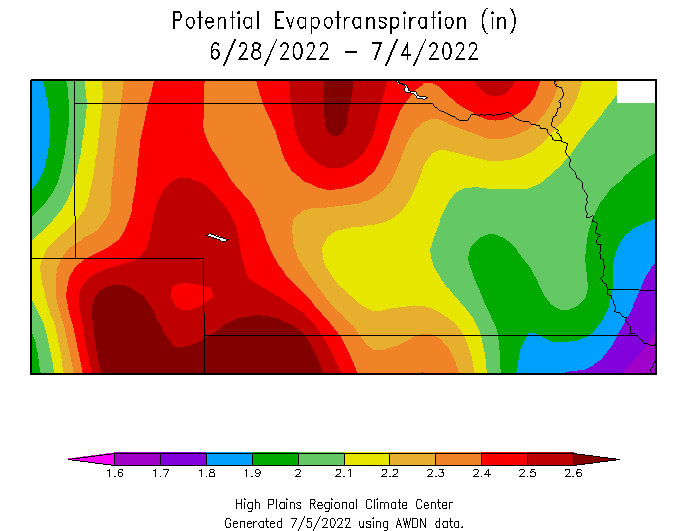 Check the High Plains Regional Climate Center's website for local, regional, and national climate data resources you can use when planning for your agricultural operation. Agricultural Water Management, including ET Resources. Information and tools for monitoring soil water and managing irrigation water resources. Nebraska Agricultural Water Management Network. Providing daily information on precipitation and ET from across the state. Using Modified Atmometers (ETgage) for Irrigation Management, NebGuide G1579. 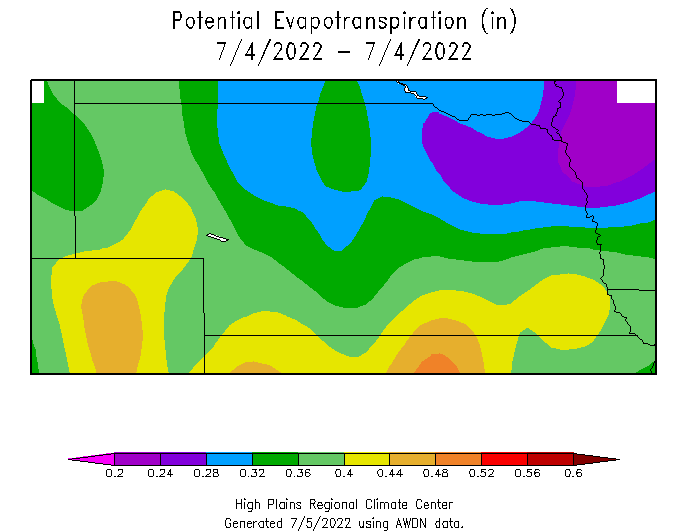 This NebGuide describes the atmometer (evapotranspiration gage) and explains how it can be used for irrigation scheduling. Examples are provided to show how information collected with an atmometer can be used to estimate crop water use for corn and soybean. These charts can be used with readings from an ETgage® or other ET reference. To use the chart, first identify the change in the ET rate across the horizontal row and then identify the current growth stage in the left column. Follow the two columns to the point where they intersect to identify the ET rate to use in your irrigation scheduling. When planning irrigation, account for soil moisture, precipitation, weather conditions, and the ET rate for growth stage of your crop. Corn Plant Development, a photo-illustrated identification guide for the reproductive and vegetative growth stages, developed by Iowa State University. The printed guide, Corn Growth and Development, is available from ISU. Soybean Growth and Management Quick Guide, a for-sale, photo-illustrated identification guide for the vegetative and reproductive stages of soybean; published by North Dakota State University. A printed guide, Soybean Growth and Development, is available from Iowa State University.